Arnold fan David Almassy from Budapest, Hungary was happy to share with us his personal photos while meeting Schwarzenegger at his own home! David was fortunate enough to get an invitation to the annual Westime Western Charity Night which helped raise 2.1 million for Arnold’s After-School All-stars this weekend! 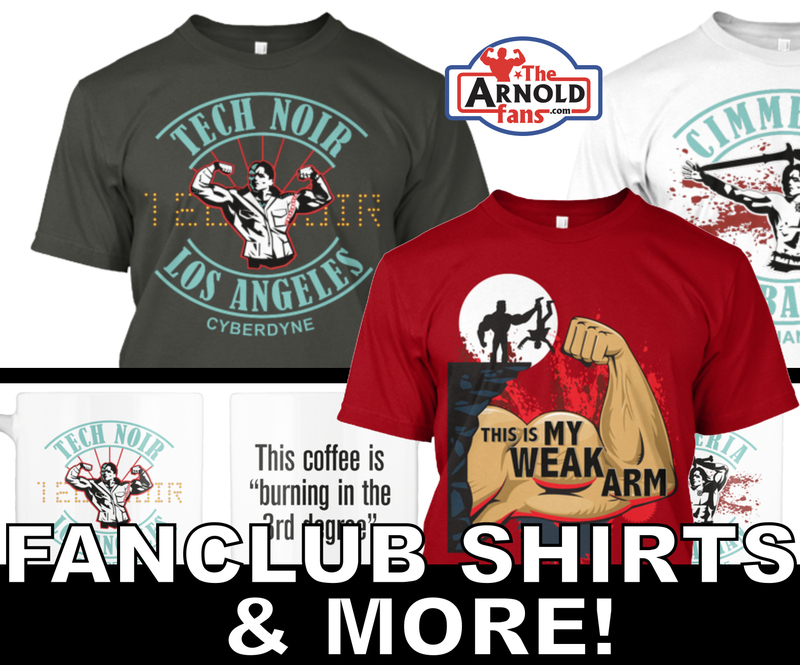 New Terminator Filming Updates: Arnold Back in the Gym! The next Terminator film is underway and we’ve already heard reports that Linda Hamilton herself has been around a film set. Terminator, currently filmed on the Isleta del Mor in in Almeria, had film crews transform the beach into a post-apocalyptic judgment day..
We’re excited to see an all new Terminator game is in the works and we’re loving the graphics! River Horse Games and Lynnvander Studios have teamed up to create an exciting new board game, Terminator Genisys: Rise of the Resistance, based on Skydance’s feature film Terminator Genisys. Earlier this morning, we all learned Arnold Schwarzenegger had gone emergency open heart surgery! It was very alarming at first hear the news with practically little to no details. We were all biting our fingernails in the suspense to hear of Arnold’s condition but thankfully someone in Arnold’s camp called us.. Contest: Win the New Arnold special issue of Muscle Insider! Exclusive: Patrick Schwarzenegger on New Film, Fitness Training & His Dad! While we were at the Arnold Classic in Ohio, our own Ryan Gillen had the interview opportunity to sit down with Patrick Schwarzenegger to talk about his new film release, "Midnight Sun” by Open Road Films. Patrick accompanies his father to the Arnold Classic almost every year so he also gave his fans a special screening of the film in Columbus Ohio. Arnold Classic 2018 Finals Winners! New Terminator Busts from Chronicle Collectibles: T-800 and an Arnold 1:1!!! The Arnold Schwarzenegger Poster Sale! Welcome to the big Arnold Schwarzenegger Poster Sale! Most of these posters below can be yours and will go to the FIRST person who claims them for the set price listed below. However, there are a few posters (listed in red) that will be offered to you as an AUCTION that ends in one week on March 17th. Buy the "R Rated in the 80’s” Poster Featuring Conan, Terminator & More! We absolutely love this all new "R Rated in the 80’s” poster printed by Vahalla Studios by artist Halland Jackson! For all of you fans growing up in the 1980s, like many of us here at TheArnoldFans, you’ll probably easily relate to this artwork and be able to identify all of these great characters from their iconic films.